I'm not sure how to categorize kigo footwear. The company refers to its products as "footwear for the barefoot lifestyle," so I guess I'll go with that. However you describe them, the shoes kigo make are a bit different from any other that I've tried. They're definitely blazing their own trail, and I like that. kigo (the company doesn't capitalize its name) is obviously completely dedicated to two principles: the benefits of minimal footwear, and the importance of making as little environmental impact as possible (as their website puts it, "shoes that are good for the body and for the Earth"). 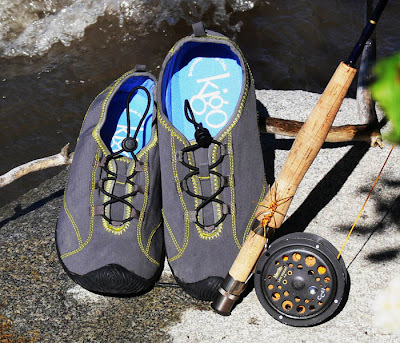 To that first end, all kigo shoes are zero drop, thin, lightweight, flexible, and without toe spring. To the second, the shoes are constructed with as much recycled material as possible (the uppers are entirely made from recycled plastic jugs, for example), made with non-toxic glues and dyes, shipped with minimal packaging in a recycled box, and so on (and the list does go on and on--kigo's dedication to environmental consciousness seems to border on obsession). The drive (again, all models are written in lowercase) is kigo's active model. 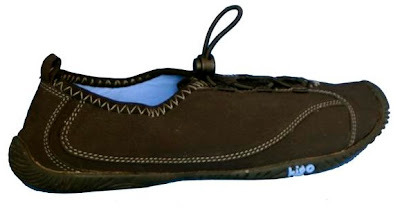 It has a canvas-like water-repellent upper, quick-adjust elastic laces, and a 2mm sole. Total weight is around 4 ounces. There is also a 2mm removable insole. 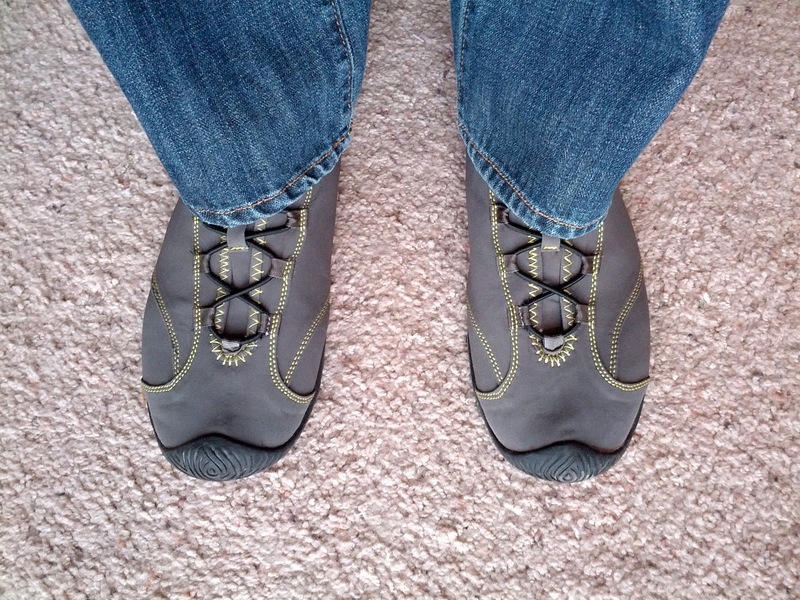 As with all kigo shoes, there is no toe spring. There are two colors available, grey and black. I got the grey. Although not a cushy shoe, the drive is surprisingly comfortable, with or without socks. 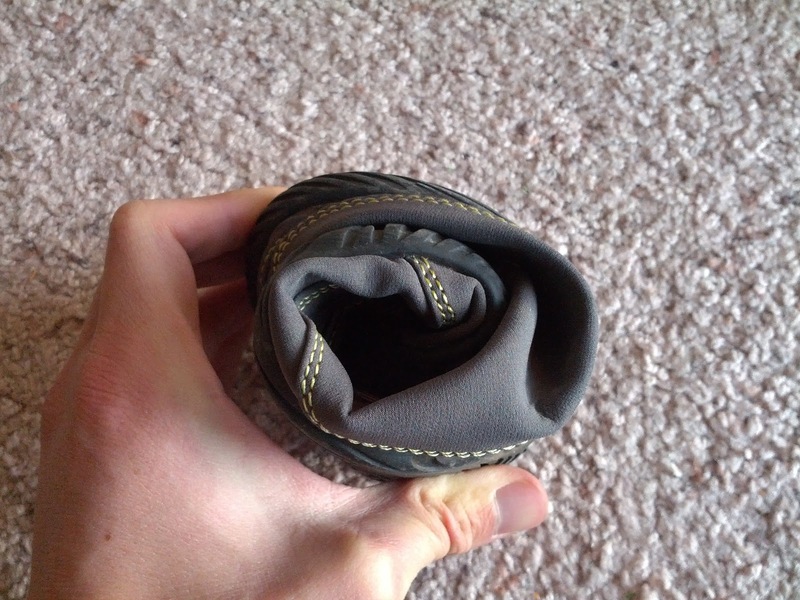 The shoe is designed to be able to be worn without the insole, and that's the way I use it. 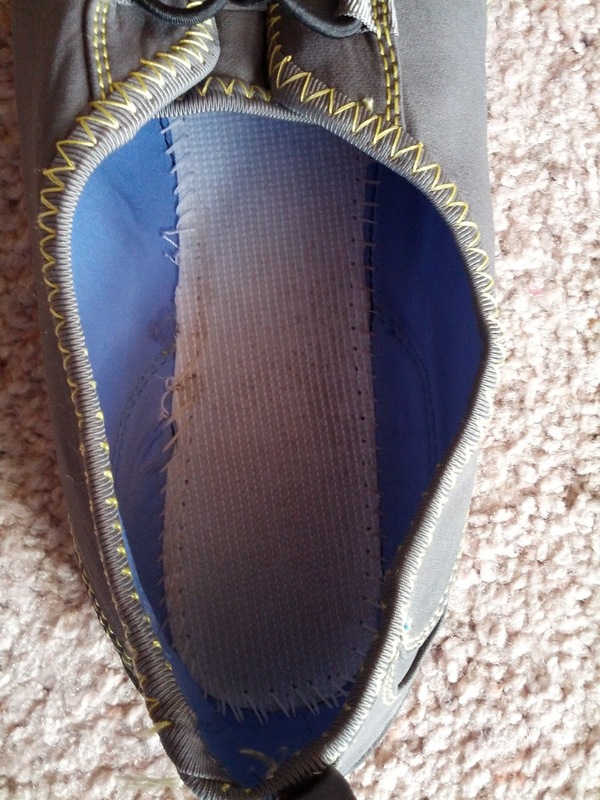 The stitching is flush so going sockless without the insole isn't a problem. The appearance is something you'll probably either love or hate, and you don't need need me to tell you which group you fall into. However, one thing that may not be obvious from the pictures is that although the drive looks a bit like a water shoe, in person the fabric has a canvas-like look and feel. For you ladies who don't like the look of the drive, kigo also makes two Mary Jane-style shoes. My wife Emily is not a fan of the drives but just ordered a pair of the flit in black to use as a semi-dress shoe. One design characteristic that I'm not a huge fan of is that the sole, in addition to having no toe spring, is flat from side-to-side as well. 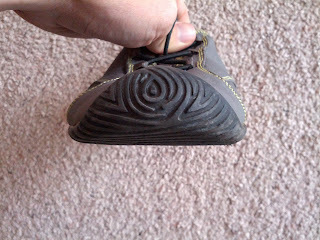 This makes the shoe want to be completely level all the time, instead of following the movement of the foot. It's not the end of the world but I found it annoying, especially in a shoe that is meant to encourage natural foot movement. The sole doesn't bend from side to side very much at all. However, from front to back it is very flexible. The drive works surprisingly well for running. The only problem I had was that the forefoot is just too narrow for me. It's not terribly narrow, and I didn't have any problem when walking in the shoe, but while running I couldn't splay my toes as much as they wanted. (My feet are probably an average width for a barefoot runner). According to the kigo website the upper should stretch over time, although I haven't noticed any difference after 25+ miles of running. I ran both with and without socks and never had any problems with rubbing, although I didn't do any long runs in the shoe. Groundfeel is very good, as you would expect with a 2mm sole. 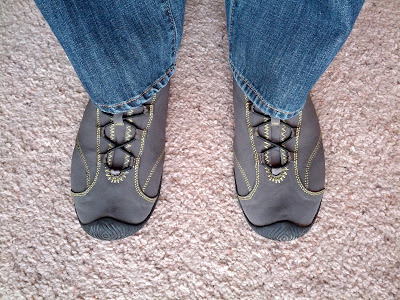 (I never ran with the insoles in since I wanted the extra room.) There is sufficient protection for running on gravel but you will feel every rock. Flexibility is good, at least front to back. I wish it were more flexible from side to side, but I don't think the lack of lateral flexibility affected my gait very much. All in all the drive felt fairly natural to run in. The elastic laces are sufficiently secure for road running and allow the shoe to be slipped on and off. Traction is good on wet or dry pavement. The kigo drive is a minimal shoe capable of doing a bit of everything. It will work for casual wear, walking, low mileage running, or for anytime you want a thin, zero drop shoe that doesn't mind getting wet or dirty. It's available on the kigo website. 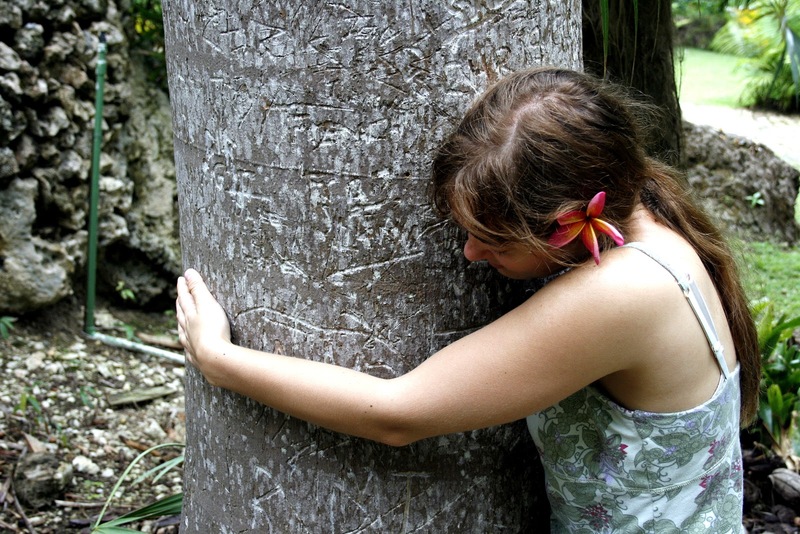 In addition, from now through December 21 you can get 50% off your order on the kigo website. You can find it here. 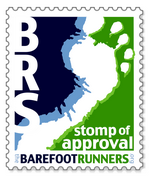 Order my children's book about barefoot running: What Should I Put on My Feet to Go Run?